The straton development kit for POWERLINK is a package for OEMs creating a new product range base on the Linux, QNX or VxWorks operating system. The straton runtime is a basic component from COPALP enabling unlimited possibilities for the OEMs as for end-users. The OEMs beneficiate of a large range of supported communication protocols (IEC61850, IEC61400, IEC60870, DNP3, POWERLINK), the integration of their hardware specific features and an integrated softPLC engine. The end-users can easily create and configure its application using the universal straton Integrated Development Environment that includes editors for the IEC61131-3 language, online debugging tools, a soft scope, fieldbus configuration tool, POWERLINK configuration and a B&R IOs configuration tool. 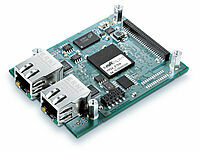 netSAFETY module as OEM-board with openSAFETY shortens development effort for Safety-integration. To make integrating openSAFETY even easier and more cost-effective, Hilscher developed the new netSAFETY module featuring PROFIsafe over PROFINET or openSAFETY over POWERLINK. 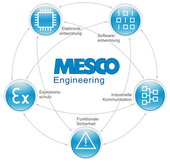 Hilscher's partner MESCO provides flexible Workshops and engineering support for custom design-in solutions using the netSAFETY module. The evaluation board featuring the new netSAFETY module significantly reduces the development time required for PROFIsafe or openSAFETY integration. With the hardware and software already perfectly harmonized, a substantial portion of the development work is already done. Plans for TÜV certification are underway, which will accelerate the certification process and lower costs even further. The evaluation board also provides key hardware and software design elements that can be adopted for custom projects. The netSAFETY module is perfectly suited as a design-in solution for HMI panels, frequency inverters, servo drives, light curtains and more – and thus simplifies the integration of safety signals into these devices considerably. With all safety signals exchanged parallel to the process-signals over the PROFINET or POWERLINK network, the Hilscher solution no longer needs extensive wiring for safety signals. The evaluation board features a netSAFETY module with a netX-52 network controller as well as two F-CPUs that combine safety communication and functional communication on a single board. The board has one safe output and three safe inputs which fulfill the requirements of SIL 3/PL e/Category 4. The Kit is suitable for development and test laboratories as well as for training purposes. 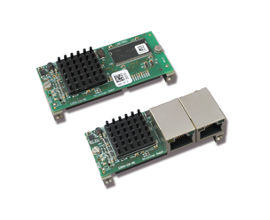 It can be used to build up a complete communication system for all Real-Time Ethernet systems. With the included netANALYZER, the performance and function of individual systems or system components, that operate according to Ethernet II IEEE 802.3 specification or corresponding bus systems, can be displayed. The netX SoC architecture is designed from the ground up for the highest demands on flexibility, determinism and performance in terms of multi-protocol capability and low latency for short cycle times. The heterogeneous multi-core architecture features an ARM processor core, coupled with a xC (flexible communication) subsystem and a feature-rich set of on-chip peripherals for varieties of industrial applications. The netX family spans a broad portfolio of network controllers for industrial markets. The network access controller is based upon the successful netX family and intended for use by customers who wish to fully control and run their software protocol stack at the host site. The netX 6 is the ideal companion chip for industry-proven embedded processors to enable access to multi-protocol network features for real-time control industrial communications. 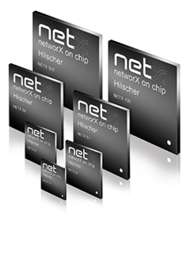 Hilscher offers customers a scalable family of netX products for slave type applications. The higher end is represented by the netX 51 which provides an external memory interface with a high-performance, multi-channel and multi-cache controller suitable for the development of cost-sensitive stand-alone applications. The netX 52 is suited for customer designs that require a multiprotocol-capable companion chip solution with host interface that fully carries out the real-time control communication tasks for industrial Ethernet. At the lower end is the netX 10 with one xC channel that commercially addresses traditional fieldbus technologies. Hilscher offers customers a scalable family of netX products for master and slave type applications. The netX 100 is typically used for the design of companion chip solutions or stand-alone applications. The netX 500 with integrated graphics controller and feature-rich on-chip peripherals is the ideal development platform for application designs that make use of embedded visualization, industrial control and system network. From concept to certified device. 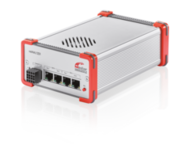 With the netX network controller family, Hilscher offers a broad range of communication technology in the industrial automation market. Thus, Hilscher is more than a chip supplier. We can fully support you along the way from concept to a completed, certified device. This includes everything from a first concept meeting, followed by basic trainings, review of the hardware design through to device certification support. We offer workshops for locating and solving software problems. The netANALYZER is a tool for the simple analysis of Real-Time Ethernet networks. The scope of delivery includes a capture-hardware for recording the telegrams on the network as well as a graphical user software for Windows with extensive analysis functions. The open driver API also allows you to use the capture-hardware in your own custom applications. Integrated Ethernet Test Access Points (TAPs) ensure the absence of reaction on the Ethernet network during the measuring process. There is no relevant additional telegram delay; a TAP physically corresponds to an Ethernet cable of only a few millimeters additional length. The measuring accuracy of 10 ns meets the high requirements of time-synchronized protocols such as IEE1588, PROFINET IRT, EtherNet/IP with CIP Sync, EtherCAT or Sercos. The supplied software allows an easy control of the recording process. The most important analysis functions such as timing and network load analysis have already been integrated in the software. In addition, up to four digital switching signals of the same time resolution can be recorded in parallel to the Ethernet signals. This allows an easy comparison of network traffic and the action or reaction of switching events. For a more detailed analysis of the recorded data, the software enables you to store files in the Wireshark.pcap format and to record data directly from Wireshark. The portable netANALYZER with its solid metal housing is an ideal tool for laboratory development or field set-up and troubleshooting. netIC is a complete ‘Single Chip Module’ in the dimensions of a compact DIL-32 IC. It is based on netX 50 network controller and contains all network specific components of a Fieldbus or Real-Time Ethernet interface with integrated 2-Port Switch and Hub. Data exchange to the host process is carried out via a simple serial port and all major Real-Time Ethernet protocols are supported as Slave on a single hardware. 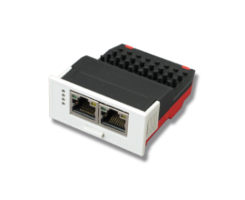 comX is a complete network interface in the standardized compact dimension of 30mm x 70mm. It is based on netX network controller and contains all network specific components, like 2-Port Switch, Hub and connector. Data exchange to the host is carried out via 16kByte Dual-Port Memory and all major Real-Time Ethernet protocols are supported as Master or Slave on a single hardware. netJACK is a complete network interface as closed IP 40 module. It is based on netX technology and can be mounted via slide-in mechanism without tools at any point of the delivery chain. Data exchange to the host is carried out via PCI Express Bus or traditional Dual-Port Memory. All major Real-Time Ethernet protocols are supported as Master or Slave on a single hardware. BV provides a software solution for the implementation for the implementation of the Ethernet POWERLINK communication protocol running on the real-time operating system QNX. 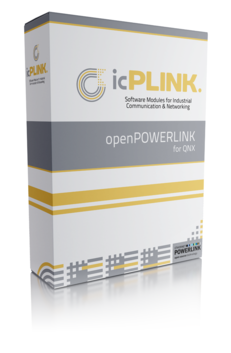 The communication stack is based on the open source package "openPOWERLINK". The Ethernet communication can be performed with help of the QNX network driver for standard applications. As an option, IBV provides optimized link layer drivers (e. g. for TI Sitara) to achieve shorter cycle times and lower CPU load. Support of "Managing Node Redundancy"
The source code can be licensed per project for a one-time fee.As a competent partner for software development and real-time operating systems, IBV provides "all-in-one" services for embedded projects. IBV provides software engineering services for development (drivers, board support packages and applications) as well as integration, support and consulting. openCONFIGURATOR is an open-source configuration tool for easy setup, configuration and maintenance of any POWERLINK network. openCONFIGURATOR ideally complements openPOWERLINK, the open source POWERLINK protocol stack for master and slave. Please visit sourceforge.net/projects/openconf/ to download the binary/source versions. as the communication backbone of their product. Kalycito is also actively helping open source users of POWERLINK via online forums. It is also working with leading chip manufacturers to integrate POWERLINK into their cutting edge designs. 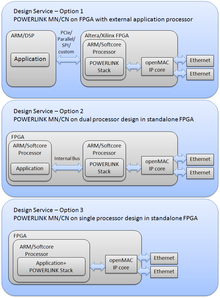 Hardware: ARM, Xilinx and Altera based FPGA POWERLINK Master and Slave solutions with driver support for Linux and Windows. Software: openPOWERLINK stack and openCONFIGURATOR on Windows, Linux and Non-OS platforms. 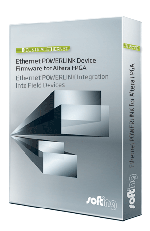 POWERLINK optimized drivers for specific Ethernet cards, IP design and integration services for Altera and Xilinx FPGA based MN/CN. Design Support: Services to enable faster time to market for OEM Customers and delivering POWERLINK based technology reference designs for chip vendors and board manufacturers. Additional Offer: Product Conceptualizing, Electronic Hardware Design, Embedded Software Development, Product Validation and Maintenance Services. Parameter changes during operation are possible. Customized development of interface modules meeting your industry-specific requirements for connection to Ethernet POWERLINK networks is an option we also provide in this context. One of the services the Open Source Automation Development Lab (OSADL) is providing to its members and to the community consists of continuously monitored systems in the OSADL QA Farm. In addition to performance and determinism data, external communication lines are tested such as a bi-directional communication between POWERLINK peers. The resulting round-trip time is displayed continuously at the OSADL website as shown in the picture. The result clearly indicates that the jitter of the 500 μs cycle interval never exceeds 30 μs and thus fulfills most industrial requirements. A description of the test set-up is given at the QA Farm overview. The POWERLINK EDS-Editor is a tool for the rapid and cost-saving creation of POWERLINK device description files (also know as EDS files) (new XML format). Furthermore it creates a detailed documentation of the parameters in HTML. With the POWERLINK EDS-Editor a tool is available, which frees the developer from error-prone and repetitive tasks. It guarantees the consistency of the Electronic Data Sheet and the documentation. By default the POWERLINK communication profile is delivered with the tool. In addition to the POWERLINK specific communication database other databases are provided for the CANopen device profiles DS 401, DSP 402, DSP 406 and DSP 417. The POWERLINK EDS-Editor eases the first step into the POWERLINK protocol and device development is accelerated. The POWERLINK Library is based on the EPL communication profile. It provides the most important services specified therein. It is completely written in ANSI-C and can be compiled with every ANSI-C compliant compiler. Depending on the required scope of functionality the POWERLINK Library is available in different expansion stages. With the standard Controlled Node version of the POWERLINK Library all services are provided for develop ment of full-featured CN devices. The functionality of the Managing Node as well as the convenient node monitoring functionality is provided by a different product. All hardware specific parts are decoupled from the POWERLINK protocol stack through a defined driver interface. The development process is supported by the POWERLINK Design Tool. 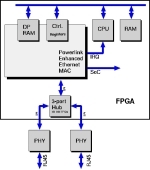 The POWERLINK hub from port is a generic hub for Xilinx FPGAs and PLDs written in VHDL. The propagation delay of 390 ns is far inferior to the time, which is claimed in the IEEE 802.3 standard. The 3-port hub features two external and one internal interface. The number of PHY ports can be expanded easily. By integrating the hub in an POWERLINK device, it can be simply integrated in POWERLINK networks with a daisy chain. An external hub is not required and extensive cabling is not applicable. In conjunction with port’s POWERLINK MAC, a highly optimized VHDL POWERLINK MAC controller for Xilinx-FPGAs and PLDs, a fast connection to your POWERLINK network is reached. This results in fast response times of Controlled Nodes. The POWERLINK Design Tool is a tool for the rapid and cost-saving development of POWERLINK applications or devices. It administers device databases, from which an object dictionary and an initialization function in C-code, an Electronic Data Sheet (XML format) and the documentation are produced automatically. Furthermore it simplifies the configuration of the EPL Library and of the POWERLINK Driver Packages. In addition to the POWERLINK specific communication database other databases are provided for the CANopen device profiles DS 401, DSP 402, DSP 406 and DSP 417. The object dictionary produced by the POWERLINK Design Tool supports numerous options of the POWERLINK Library from port, e.g. segmented structuring. The POWERLINK Design Tool eases the first step into the POWERLINK protocol and device development is accelerated. The POWERLINK Enhaced Ethernet MAC Controller (PE2MAC) developed by port is a special MAC controller optimized for Ethernet POWERLINK for FPGAs. Through several special transmit buffers and the possibility to respond automatically to POWERLINK frames by hardware, extremely short response times are reached. Special receive filters allow pre-filtering of POWERLINK messages by the MAC controller and releases the software from this tasks. These filters support the pre-selection of Ethernet frames, that are needed by the processing software. Based on the used settings only those frames that match the filters are stored in the receive buffers. This mechanism releases the CPU from processing frames not relevant for the software. In addition to the universal hardware, the FPGA RTEM CIII features a uniform software interface for the current standard solutions. The Simple-Device-Application-Interface (SDAI) is an efficient protocol abstraction layer that is designed to offer a single application interface for the standard solutions helping to significantly speed-up device integration and time-to-market, while simplifying support and maintenance. The SDAI is designed to support single and dual processor systems. Furthermore, the Transparent IT Channel provides access to embedded IT applications through the same communication interface and operates simultaneously to the real-time communication. These applications, e.g. web server, email, or even customer specific services, can run either on the module or directly in the device. The SPEAr Net Evaluation Board lets you evaluate STMicroelectronics’ SPEAR-07-NC03, a smart Communication Controller for Universal Serial Bus (USB) and Ethernet communications (Starter kit order code: STEVAL-SPEARNET). The SPEAR-07-NC03 enables the sharing of full speed USB host, IEEE1284 or Universal Asynchronous Receiver Transmitter (UART) peripherals within an Ethernet system. This document explains how to easily get started on developing applications for an Ethernet system that uses various communication interfaces. The 12 V AC/ DC board supply voltage provides 1.8 V, 3.3 V and 5.0 V output voltage ranges. 14-pin and 20-pin JTAG connectors makes developing your applications easier. For information on the SPEAr Net operating system, software d. and application development, refer to UM0195. The STR910 evaluation board (STR910-EVAL) is a complete development platform for the STMicroelectronics’ ARM® core-based STR91xF. 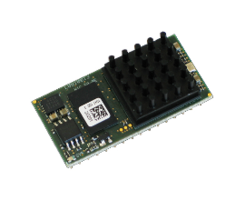 Based on the ARM966ES core, the STR91xF includes Pre-fetch Queue and Branch cache, full speed USB 2.0 compatible port, Ethernet 100/10 interface, Embedded MAC, CAN 2.0B compliant interface, a large Dual Bank Flash memory, a large SRAM and many peripherals. It includes an STR910F microcontroller and preloaded demonstration software and a full range of hardware features to help you evaluate device peripherals (Motor control, IrDA, USB, Ethernet, CAN, … etc.) and develop your own applications. Extension headers make it possible to easily connect a daughter board or wrapping board for your specific application. Common API to application programAdditionally, we offer an EPL Starter Kit consisting of a development board with Freescale Coldfire processor, Linux BSP and an evaluation version of the ETHERNET POWERLINK Protocol Stack. With their AM335x microprocessor family, Texas Instruments have announced an important step toward easier design of industrial automation applications through higher integration of functionality for that market, including real-time communication via POWERLINK. This microprocessor family is cost-effective enough for use in generic I/O devices and has the power and graphics support required in controlling and HMI systems.What makes it most attractive for industrial control designs is its integrated support for Industrial Ethernet. It features both master and slave functionality for POWERLINK. Communication is performed by the integrated Programmable Real-time Unit (PRU), utilizing the Open Source POWERLINK stack. This guarantees POWERLINK’s uncompromised real-time properties without charging the CPU with the extra load. 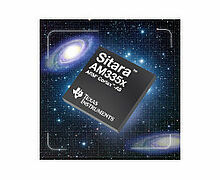 XMOS xCORE-Analog devices provide low latency, deterministic processing with integrated analog peripherals. The xCORE DSP instructions can be utilized for filtering and conditioning the data, before sharing via a wide range of software-defined interfaces. Supporting power management functionality such as deep sleep, power consumption can be reduced to just 500uW. The Institute of Embedded Systems is the one-stop shop for development and support for the implementation of Real-Time Ethernet communication protocols, specifically ETHERNET POWERLINK. 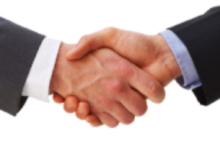 We offer our project partners access to RTE stacks, porting services, acceleration technology, hardware and software design services as well as general consulting and training services. MultiNet is a standard PCI card used for the evaluation, validation and measurements on Real-Time Ethernet (RTE) networks and especially suited for POWERLINK. It boasts 3 Ethernet connections, jumpered as either standard Ethernet connections or passive-sniffer allowing the user to unobtrusively sniff RTE networks. A FPGA contains appropriate technology ranging from a simple hub right through to RTE accelerator technology, for instance EPL Express, whilst the local ARM-Processor handles all RTE protocols. 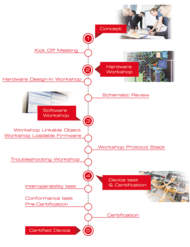 MultiNet is one of a series of licensable technologies developed by the Institute of Embedded Systems enabling an easy entry into the exciting RTE market. The High Resolution Timing Analyser (HRTA) is a unique device for making measurements on Ethernet networks and optimized for Real-Time Ethernet protocols (RTE). With a resolution of 20 ns it is possible to timestamp every packet on the wire. The physical interfaces are passive, meaning the HRTA can be inserted between two devices without using a hub/switch. It is possible to trigger on specific packets and even external digital inputs. The device can be used in both the laboratory and in the field. The HRTA technology is available for licensing.